Street lighting improvements at the Batavia Road and Route 56 intersection. Pedestrian lighting improvements along the north side of Route 56 from Batavia Road to Williams Road. City monument signs at 3 locations on Route 56 from Briggs Avenue to Winfield Road. City monument columns at the Butterfield Road bridge over the West Branch Dupage River. Landscape improvements at various locations on Route 56 from Briggs Avenue to Winfield Road. The project was awarded to Thorne Electric. Construction is 9% complete. Final punch-list walkthrough will occur in Spring 2019. 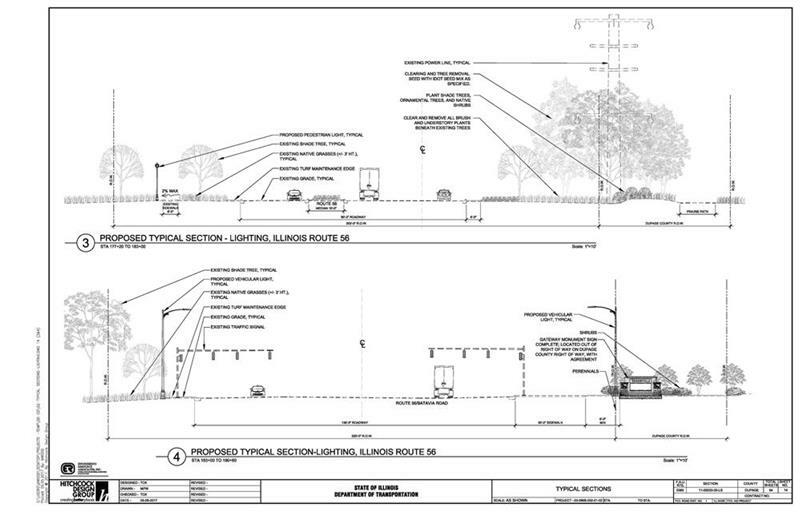 Landscaping plans for the area between the Prairie Path and Butterfield Road from Rockwell Street to Batavia Road can be found here. Monument & Other signage plans can be found here.